A group of nine West Coast Eagles players will head to Cambodia on Thursday, embarking on a five-day community service tour to an underprivileged village in the Kampong Speu Province. 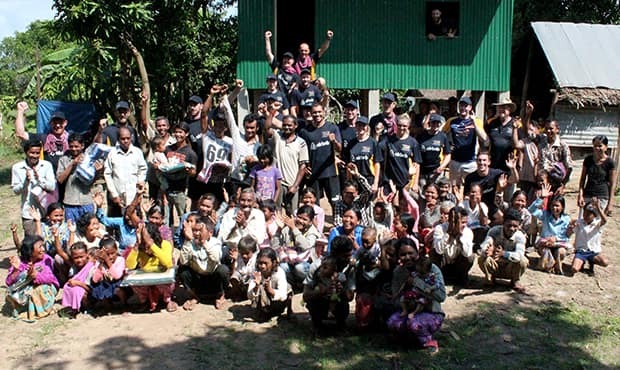 Thanks to Airbnb, the official partner of Cambodia 2017, Elliot Yeo, Tom Barrass, Liam Duggan, Dom Sheed, Kurt Mutimer, Matthew Allen, Tom Cole, Luke Partington and Jackson Nelson, along with West Coast chairman Russell Gibbs and a group of coaches and staff, will build houses for a remote village situated over an hour outside the country’s capital of Phnom Penh. The travelling party will also take in a cultural history tour to learn more about Cambodia’s tragic past, get a first-hand account of the atrocities committed by Pol Pot’s Khmer Rouge regime and to see how a nation of people have built the resilience to overcome them. West Coast Eagles head of development Gavin Bell says the trip is a great chance to improve the lives of hundreds of people but also to enrich their players’ lives. “With the assistance of Official Partner of Cambodia 2017, Airbnb, our players will be given the opportunity to change the lives of people living in a village in the province of Kampong Speu,” Bell said. “We will build 20 houses over two days. We will be working alongside the families who have saved for five years to raise the $25 to build their dream home and keep their families safe. The club and Airbnb have contributed the balance for the house build, which is $2000 per house. “Kampong Speu is one of the poorest regions of Cambodia and it’s very susceptible to flooding. By building houses that are up on stilts, we increase the families’ odds of having their children complete primary school by 60-70%. “The players are taken completely out of their comfort zone and they gain an understanding of a way of life that is almost unfathomable to them. It opens their eyes to struggles they will never have to face and to experience a level of resilience that is incredibly inspiring. The club has again partnered the Tabitha Foundation, a charity active in the region and committed to improving the lives of the impoverished Cambodians for many decades.